What I meant was . . . | Afterthoughts & Other Things . . . This past week we looked at 2 Peter 2 where Peter is writing about false teachers & prophets. In our time together I noted some examples of false teaching of our day. Ironically, an example of false teaching arrived in my inbox this morning. One of the blogs I subscribe to is Justin Taylor’s, “Between Two Worlds” from the Gospel Coalition site. Justin collects some great material in his blog. I often find it beneficial for my teaching and our ministry as well as to my own walk with the Lord. Today, he highlights the death of Clark Pinnock. I heard Pinnock speak at PBU many years ago. He was presenting his case for inclusivism, the theology that people can be saved by Christ although they have no knowledge of Him. I wasn’t convinced that night and I’m still unconvinced! Too many statements by the Lord Himself that I can’t get around to land in the same place as Pinnock. But many people have decided that inclusivism is true. I think there are a lot of reasons why people choose to beleive this. Perhaps the most probable is that God can’t be so cruel as to condemn people who have had no chance to hear of Christ’s redeeming mission to Earth. At least that’s how they would summarize it. So they repackage the truth for their own comfort. You can read Taylor’s comments here if you’d like. synopsis of what I was thinking. The passage starts off by saying that Peter did not use “cleverly devised tales” as he made known the power and coming of Jesus. Well, we began the service by watching Vince in action. We played the 2 minute Sham Wow infomercial and talked about how we typically respond to those appeals. The fundamental problem with them is that they are so unbelievable! When Vince says you can use th Sham Wow in the kitchen, on the car, on the boat and on the RV. It works wet or dry. It holds 12 times its weight in liquid. All that is too much to swallow. So Madison Avenue tries to find the most believable person to pitch their product. Either a real person to talk about why you should buy their product or a really believable fake person to convince you to put your money down! Then you read 2 Peter 1:16-21 and here is Peter “selling” an equally unbelievable “product” — that the sinless son of God would come to Earth and pay the punishment for admittedly guilty people. Or that it is faith alone in Jesus alone that saves us from our sin — another unbelievable claim. So here is an utterly incredible claim being made by Peter, God’s chosen pitch-man. What made Peter believable? His life matched the message of the Messiah. Madison Avenue finds the most articulate, good looking famous person to pitch their products. Jesus chose a smelly uneducated fisherman that was stubborn, outspoken, opinionated, cowardly and ultimately betrayed his Master. But look at the man Peter had become in Acts 2. Confident, bold, articulate, and powerful. 3,000 respond to his message. In the years to come Peter is imprisoned and whipped, mistreated for the sake of his Master. Jesus’ pitch-man finally has his life taken from him as he is crucified upside down. Peter says he knows the “product” because he witnessed it at work (v.17). He knows this man Jesus and this is not advertising text he is reciting for profit. “We ourselves heard this” and “we were eyewitnesses” sets this pitch-man apart from anyone who ever appeared on a box of Wheaties. So how does Vince the Sham Wow guy fit in? 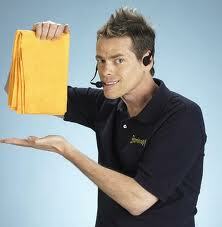 Who knows if Vince ever used a Sham Wow. Who knows if Sham Wows really hold 12 times their weight in liquid. (mine doesn’t!) His message seems unbelievable because it is too good to be true and because he seems unbelievable. But Peter’s message, which is equally unbelievable, has power due to the life of the messenger. Now the question you and I have to wrestle with is this: does my life enhance the message of Jesus or distract from it? Sunday’s message was how we spend too much time fixating on financial stewardship while we neglect stewardship of the most precious treasure we have — the Gospel message! Anyway, I said a lot of stuff and as I was speaking it seemed to come our more harsh than I when I prepared it. I didn’t intend that but I do think our church as well as most others find it too easy to be distracted from what is most important. #1 — Too many churches have a “Don’t ask, Don’t tell” culture that exists. We all silently agree not to ask each other who we have shared the Gospel with so we are not accountable for doing so. I don’t believe this is a conspiracy, but I do think it is a trap we fall into and must break out of. Let’s start asking each other and praying for each other. #2 — Consider the parable of the man who found the field with the treasure hidden in it. He ran out and sold all he had to possess the treasure. Have you sold all you have to possess the treasure of the Gospel? Have you held back something for yourself? If so, then you really don’t possess the treasure yet. #4. — Actually this tidbit isn’t from the message. John Ashton sent it to me later in the day. His comment was that a good steward must know the owner’s desire in order to please the owner. What a great comment! Do we know what Christ’s desire is for us, his servants, those who are charged with managing the Gospel story? I fear that too many feel the story is for them alone and never feel compelled to share it. #5. — I am the worst of sinners in this area. I have enjoyed sharing the Gospel when I have do so. But I am the worst at feeling like I don’t have time. When I do that I am prioritizing my mundane task (cleaning the garage, washing the siding — you know really important stuff) over my responsibility of stewardship of the Gospel. My greatest downfall is robbing time from my family or from my time in the Word or from building relationships for stupid stuff that will one day burn to a crisp. God forgive me for my ignorance! How to really foul up the closing challenge to your Sunday morning message! On Sunday as I closed out our time together in the Word, I should have held up the slip of paper and said, “Based on all that God has forgiven you for, what could you possibly not forgive someone else for?” In other words, how can we hold a grudge or withhold forgiveness from someone else when we have been forgiven for so much? We’re going to explore this theme more this week next Sunday. I’ll try to get it right! I didn’t plan on anything unusual happening in the service on Sunday. I wasn’t looking for an opportunity to make a statement. It just happened. Somewhere in the middle of my sermon I became aware of several students giggling, laughing and carrying on. At one point I thought I heard the sound of a text message dinging on a cell phone but I can’t be for sure that was actually what I heard. A few minutes later I noticed the distraction still taking place. Then it happened. Words starting coming from my mouth and I was saying things that weren’t in my message text. I honestly don’t know all that I said. But I know what I wished I would have said. I wished I had said that our discussion that morning was the most important thing they could be considering — that the Gospel is of utmost significance above and beyond all things. I wished I had said that my deepest longing for each and every one of them was for them to know Jesus and have Him change their life. And that anything keeping them from understanding that has to be thrown aside and forsaken. I wished the words that came from my mouth had in some way communicated all that I wanted for them — all that Jesus wants for them, a rich, full life that has the capacity to handle any adversity, all the hardships; to live without guilt or shame through Him. To live with an eternal purpose! Instead, I said to be quiet and pay attention. Not a statement that is wrong. It’s a good thing to be quiet and pay attention. But in this case it was an incomplete statement. Wanta buy a dead slave? Last week when we were looking at Hosea purchasing his unfaithful wife (I hate her name!) from the slave market I mentioned the price he paid was equivalent to that of a dead slave. Since that message I have had a few comments like, “Why would any one buy a dead slave?” I admit fuller explanation is needed! So the price Hosea paid for his wife was the price that a slave owner would be paid as reimbursement for a slave that was killed by a bull. The point I was trying to make was that though alive, Gomer only fetched the price one would recieve for a slave that had been killed. The price paid for Gomer signified the value others placed on her — she was as good as dead. Yet, here was a man buying her not as a slave but as a wife! Can you imagine the talk on the street!